Some years ago, in a review here, Bill Burr was proclaimed “comedy’s future.” On seeing the concert film “Louis C.K: Hilarious ,” it could be said that there are a few alternate futures to choose from. In “Hilarious,” Louis C.K. takes on a wider range of subjects than in “Chewed Up,” his last album and special, which ran on Showtime rather than as a full length film. “Chewed Up” dealt with marriage and kids, but since Louis has gotten divorced, his material about his children has taken a different spin. 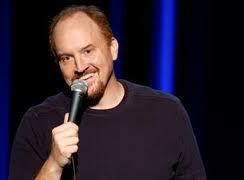 The end result is that “Louis C.K. : Hilarious” is as memorable a stand-up concert film as Bill Cosby’s “Himself” was nearly 30 years ago in an entirely different media universe. As you can see, the sheer quotable resonance of the pieces in “Louis C.K. : Hilarious” makes it memorable. What Louis C.K. has done is inject more edge and a nastier bite into subjects that appeal to a broad audience, and keep that comedic fire burning longer. A one-hour version of “Louis C.K. : Hilarious” airs on Comedy Central Jan. 9. The full feature film will be released on DVD on Jan. 11, along with a CD version.